Where are there any real surprises these days? We've been asking ourselves this question for a long time and that's why we'll just be a good role model for surprises! Are we taking you on a strange journey in the Mystery Train? Or even on the Magical Rock'n'Roll Mystery Tour? 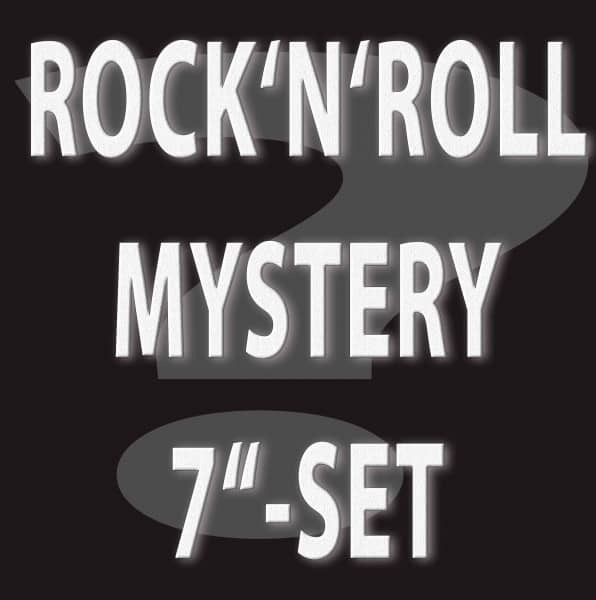 Because here comes the Magic Rock'n'Roll Mystery Set! This set is a surprise package for the absolute best price! There are plenty of treasures in our pool, all unique pieces (no junk! ), which we can't put online because of the quantity, but which we don't want to keep from you either. So to speak the Bear Family surprise egg for Rock'n'Roll freaks, because this is about Rock'n'Roll, just Rock'n'Roll! Each set contains five high-quality vinyl 45s at an unbeatable surprise price, by the way also suitable as a gift! Only singles with a large inner hole are included in the set, for use in the juke box! Note: The vinyl is new and unplayed (Mint)! Cover or sleeves can show bearing damages with older new commodity, like e.g. bends or light stains. Customer evaluation for "Rock And Roll Mystery 45-Singles-Set (5x 7inch, 45rpm)"
Hat zusammen mit dem Mystery Lp Set Spaß gemacht! Ein Überraschungspaket welches, wie von Bear Family vorausgesagt, grundsätzlich kein Schrott ist! Am Vinyl gibt es nichts zu meckern. Ok, wie auch beschrieben, können "Lagerspuren" vorhanden sein. Doch liebe Bärenfamilie, kehrt einmal in euch ein: wenn die Singlehüllen teils komplett zerrissen sind (und das bei einer ziemlich alten, weißen neutralen) oder schon sehr arg gelitten haben (wie bei einer mit Labelaufdruck), bitte - dann packt doch noch mal jeweils eine neutrale weiße Hülle zum Aufbewahren dazu. Das müßte doch drinnen sein? Daher mal nur 8 statt 10 Sterne.